As the administration and members of Congress debate the path to fiscal sustainability, my colleagues and I at CBPP have consistently stressed the importance of a balanced plan that combines both spending cuts and revenue increases. 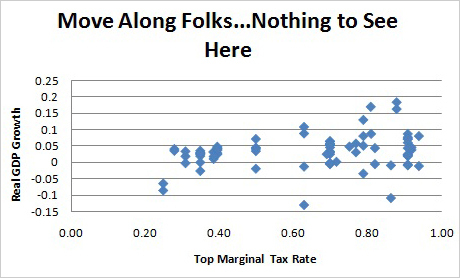 But mention "revenues" in this town and you trigger the attack of the NASTIE’s (Never-A-Stinkin'-Tax-Increase-Ever!). Their typical argument is that any increase in tax rates will do irreparable harm to the economy by killing peoples’ incentives to work and invest. It’s an old argument, prominent in the Reagan years, when the tradition of tax cuts leading not to unbridled growth but to large budget deficits got started. But it was most fully developed in the GW Bush years, when it led to tax cuts that helped to turn a budget surplus into the persistent deficits that dominate the fiscal scene today. OK, so tax cuts don’t magically balance budgets. But do they boost growth and jobs? Um…no. As my colleague Chad Stone shows here in comparing the 1990s (Clinton’s tax increase) and the 2000s (Bush’s cuts), the opposite is true. I think those two decades make for an excellent natural experiment, but you may be thinking "Wait a minute, that’s just two time periods." 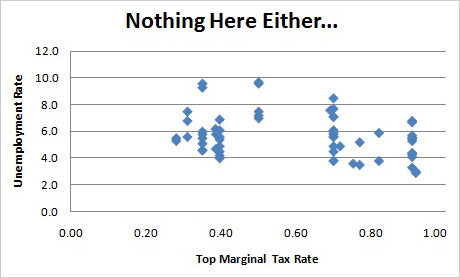 The scatterplot below plots the top marginal tax rates on the x-axis against real GDP growth on the y-axis. Only the nastiest of NASTIE’s could stare at that picture long enough to see anything non-random. What’s that? You want more. How about the same graph re unemployment? Again, if anything, there’s a drift to the lower right of the chart, suggesting higher rates correlate with lower unemployment. To be clear, this is “blogometrics” not econometrics, i.e., the economy over these many years has vastly different moving parts, there are timing lags, causation issues (recall war point above; also if policy makers lower taxes when growth is weak, as in the Recovery Act, you’ll get patterns like the above), Federal Reserve policies that can amplify or counteract tax effects, the tax system is way more complex than can be captured with just the top rate. And no question, it is of course the case that big tax increases could derail growth, though that’s not what anybody’s talking about (President Obama’s proposal to allow the highend Bush cuts to sunset would still leave taxes lower than in Clinton years). In fact, the economic impact of tax changes is an important area of inquiry and the simple evidence I’ve presented here is not at all intended to be the last word. But that said, the point is this: the historical record is extremely hostile to the NASTIE’s. Based on that record, if they continue to insist that revenues must stay off the table in the budget negotiations, they need to find another reasons than growth or jobs.